The domestic airport at Bhisiana near here is all set to get going by the next three months. During a visit to the district to review the infrastructure available as well as to study the passenger traffic from Malwa belt, a delegation of the Airport Authority of India (AAI) told the district administration that the authority may start domestic flights at the newly constructed airport by the next three months. With the strike by lawyers entering its sixth day today, litigants are finding themselves at the receiving end. Litigants visiting the courts cursed the existing system, which allows lawyers to hijack the functioning of courts. Lawyers, however, expressed their helplessness in carrying out the work. 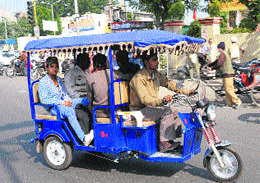 The city has a new battery-operated rickshaw running on its roads drawing attention of the traffic. Owned by Uttam Singh Makkar, a resident of Bibiwala Road, the rickshaw has been operable in the city for the past three months. Designed to carry four people, including the driver, the rickshaw can be operated within city limits only. It has four batteries that are charged in six hours and are of 250 watts. A number of measures to streamline the police functioning were taken during the one-year stint of Ravcharan Brar as the Bathinda SSP. 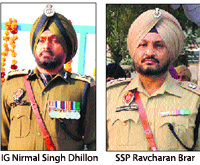 Brar will now join as SSP Ropar and Gurpreet Bhullar, SSP, SAS Nagar would replace him in Bathinda. The Amritsar (rural) police today claimed to have arrested the remaining two persons who were involved in the looting bid at a famous cloth shop in Khilchian last evening. Fifteen persons from different walks of life will be honoured at the 35th Prof Mohan Singh Mela being held here on November 22 and 23. Announcing this, the chairman of Prof Mohan Singh Foundation, Jagdev Singh Jassowal said 15 personalities related to rich heritage and culture of Punjab will be honoured. The giddha team of Government Rajindra College won the second place in the inter-varsity youth fest held at Lyallpur Khalsa College, Jalandhar, was felicitated at the college today. Fifteen passengers were injured when the private bus they were travelling in overturned while overtaking a truck trailer near Chathewala village at around 9 am today. The Vigilance Bureau, Bathinda, today arrested Prahlad Mangla, agriculture field officer at the Rampura branch of Punjab and Sind Bank. The officer is accused of demanding Rs 3,000, one per cent of the Rs 3 lakh loan against agricultural land sanctioned to a farmer. Led by the Deputy Director General from the Directorate General Civil Aviation (DGCA), Lalit Gupta, the delegation including Captain Vineet Bhalla, Captain Makkar and Captain P Joshi, visited the Bhisiana airport, met the officials of the Air Force and held a meeting with representatives of the hospitality industry, travel agencies and tourism department in the district. Deputy Commissioner Kamal Kishore Yadav said the visiting team found the airport technically sound. It studied the possible number of travellers, needs of traders interested in flights and the demand for airport from the tourism point of view. It is learnt that Gupta expressed satisfaction over the runway, security and other facilities available at the Bhisiana airport. The delegation will now submit its report on passenger potential to the Ministry of Civil Aviation. Informing the visiting delegation about the importance of Malwa belt that boasts of several religious places, including Takht Sri Damdama Sahib, Yadav said Malwa hosts important religious events like Baisakhi Mela at Talwandi Sabo, Maghi Mela at Muktsar and Baba Sheikh Farid Aagman Purab at Faridkot, which draw pilgrims from far-flung areas. Besides, industrial units like Guru Gobind Singh Refinery and National Fertilizers Limited (NFL) and defence units of Bathinda cantonment and air force base have turned Bathinda into a hub of economic activity. The Deputy Commissioner added that in Punjab, the VAT on air fuel was mere 5 per cent, which was a good proposition for companies in aviation business. The Bathinda Hotel, Resort and Restaurants Association president Satish Arora said the hospitality industry was keenly waiting for domestic flights to begin from Bhisiana. "Besides religious tourism, the Malwa belt is a hub of Bt cotton grown in Punjab. Most of the Bt seed and technical know-how is taken from Gujarat. In absence of good connectivity, traders from Gujarat hesitate from visiting the Malwa belt. Starting domestic flights from Delhi will offer better connectivity to such traders," he said. Arora added that the team talked about starting one flight up and down daily, which could also be taken via Amritsar for increased revenue. Also, Bathinda has of late become an important place for the Punjabi film industry, which could be greatly benefited with the airport, Satish Arora said. Prominent among others present at the meeting included ADC Rajiv Prashar, tourism officer Pawandeep Sodhi and representatives of different travel agencies. It may be mentioned here that the state government had constructed a domestic airport near the Bhisiana Air Force base a year ago after acquiring land from Virk Kalan village in Bathinda district. 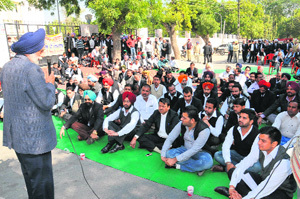 Members of the District Bar Association (DBA) went on strike in protest against shifting of power to the SDM under the new Punjab Rent Act and in favour of their demand to take action against the Civil Line SHO Sikandar Singh who allegedly passed unsavoury remarks against the lawyer community. Sikandar though refuted the allegation, SP (Detective) Naveen Singla, who held an inquiry, recommended departmental inquiry and action against the SHO, if found guilty. Litigants visiting the courts here are a harried lot. “Though the fight is between lawyers and policemen but hundreds of litigants like me are harassed without any fault of ours. The government should bring in a system so that litigants do not have to face inconvenience during such situations,” said Dr Dheeraj Dixit, pleading a matrimonial dispute in Bathinda court. Dheeraj also exchanged heated arguments with a section of court officials and policemen over the issue. Meanwhile, the advocates have now decided to protest against the district administration too if the authorities concerned failed to take action against the “erring” SHO. From Monday onwards, they would be holding a joint protest against the police and the administration. DBA president Mohinder Sidhu and former DBA secretary Gurwinder Mann have refuted the reports of extending help to the lawyer who is fighting a legal battle against his tenant to evict him from his shop on the GT Road. “We have clarified to the members of Beopar Mandal that the DBA was not extending support to the personal case of the lawyer but are protesting against the unpleasant remarks made by the SHO,” said Mohinder Sidhu. “Our fight is only against the SHO, who not only misbehaved with a senior lawyer and other members of the DBA but also made remarks against the lawyer fraternity,” added Gurwinder Mann. The strike in connection with the new Punjab Rent Act has also been postponed by advocates till November 20. Balwant Dhillon, Chiranji Lal Garg, Sukhdev Bahia, Sukhdarshan Sharma, Manpreet Brar and Bikramjit Ahluwalia addressed the dharna. The city has a new battery-operated rickshaw running on its roads drawing attention of the traffic. Owned by Uttam Singh Makkar, a resident of Bibiwala Road, the rickshaw has been operable in the city for the past three months. Designed to carry four people, including the driver, the rickshaw can be operated within city limits only. It has four batteries that are charged in six hours and are of 250 watts. “We have launched just one rickshaw to study its viability and response. Since it cannot carry luggage and cannot ply out of the city it is not a sound investment for poor rickshaw-wallahs. It’s only corporate houses or businessmen who can run these rickshaws on rental basis,” said owner of the rickshaw Uttam Singh Makkar. Makkar owns a ration depot, which no more remains a lucrative business. During his visit to Delhi, he came across such battery-operated rickshaws and decided to invest in one costing Rs 1.10 lakh. “These rickshaws are China made. Having a battery of 2509 watts, they do not fall under the ambit of the Motor Vehicle Act (MVA) and hence cannot be enrolled or registered with the state transport department,” he said. Makkar plans to add more to his fleet by the year end. The new additions will have capacity to carry load. Meanwhile, Chandigarh-based Navdip Asija, a research scholar with the IIT Delhi, said such rickshaws did not have a secure future. “Firstly, these rickshaws do not have recharging stations, which limit their movement in a restricted area. Besides, after a year and a half of working, its batteries get exhausted and have to be changed. This change requires an investment of Rs 20,000. A poor rickshaw puller cannot afford such a huge yearly investment,” he reasoned. Asija added that contrary to popular belief that battery operated vehicles are pollution free, these vehicles are run on thermal energy that is withdrawn from thermal plants by burning coal. “A rickshaw running even on substandard kerosene generates lesser pollution than a battery operated one, he said. He said such vehicles were commercially viable only in confined areas where all other means of transport are banned. One such example is of Chhatbir Zoo at Banur (Patiala) where battery operated golf carts have replaced the cars visitors take inside the zoo premises. Also IG, Bathinda Zone, Nirmal Dhillon has been shifted to Ludhiana where he would join as Commissioner of Police. The IG served for nearly four years in Bathinda. Sharing his experience, IG Dhillon expressed complete work satisfaction and said he would never be able to gain the experience and learning which he obtained in the politically important district of Bathinda. SSP Ravcharan Brar said there was a lot to be done in Bathinda. Brar spent a year but managed to bring down the crime graph to a great extent. Under his operation cleanup, which was launched after his joining on October 15 last year, he got one DSP, two SHOs, a DTO along with his staff members and middlemen, arrested for different anomalies. The WASP unit, women helpline, Eagle Squad and better coordination among the police officers, deployment of 25 PCR bikes were witnessed during his stint. Ravcharan is famous for spending extra hours at his office where he meets the complainants and informers for a patient hearing. “Since our boss used to sit in the office till midnight, the police force, especially those on the night vigil or deployed at the nakas used to perform their duty with extra alertness,” said an SHO deployed in the city. More than a dozen cops including two ASIs and head constables were suspended four being caught napping at night police nakas on Brar’s orders. “The entry and exit points of city, which were earlier lying open for criminals during night hours were plugged with the deployment of SHOs vehicle,” the cops said. Apart from vigil the blind murder case of a woman, who died after a bullet hit her head in a hotel, on Karva Chauth night was cracked, murder of a man killed by unidentified persons in Uria Basti was also traced under the supervision of Brar. Also encounter of two jail inmates who flee from a police van while returning from Panchkula after killing a cop was also done on the directions of Brar. Sources close to Brar said though initially he was pleased to get another post of SSP in Ropar, he wished to carry on his work in Bathinda. Two incidents of lawyers’ protest were witnessed during Brar’s stint in Bathinda wherein former ASP Patil Ketan Baliram was transferred to Amritsar for beating up the son of a senior lawyer and SGPC member and now the fresh controversy with allegations of misbehaviour by the Civil Lines SHO with a senior lawyer. Those arrested were identified as Baljit Singh and Laati, both residents of the Rattangarh area. Their third accomplice was caught hold by the shop owner Rajinder Kumar and his employees on the spot. Lovepreet Singh, one of the employees of Rajinder Kumar, was shot dead in the yesterday’s attempt, while his son Rahul had narrowly escaped in the incident. Jasdeep Singh, SP (D) Amritsar (rural), in a press conference held here today, said that two out of the three accused, who were covering their faces, had entered the shop and threatened Rajinder to hand over all cash he had. However, Loverpreet showed some courage and nabbed one of the culprits. However, his accomplice shot at him, which proved fatal for him. The accused also fired at Rahul and Rajinder, who luckily escaped. But Rahul injured his hand in the incident. Rajinder and his employees nabbed their third accomplice Satnam Singh, while the remaining two ran away. Jasdeep Singh said immediately police parties were dispatched in different directions, which managed to arrest the accused within six hours of the shoot-out. The police recovered two countrymade pistols and a sharp-edged weapon from their possession. A case under Sections 302, 307, 393 of the IPC and 25/27/54/59 of the Arms Act has been registered in this regard. He said further investigations were on. Gurmat Sangeet Samrat Padamshree Prof Kartar Singh will be awarded Hind Pak Brotherhood Award, Sant Kahan Singh Sewa Panthi will be conferred with Gurmat Prachar Puraskar, Pandit Girdhari Lal Sharma will be honoured with Bhai Ghanaiya Ji Award, K Deep will be awarded Punjab Folk Singer Award, lyricist Swarn Sivian will be awarded Shiromani Punjab Geetkar Award, Dr Surinder Dosanjh will be awarded Shiromani Aalochak Chintak Award, Jaswant Singh Saidoke will be awarded NRI Media Award, Hardev Singh Lalbai will be awarded Shiromani Kavishree Puraskar, Balvir Bhatia will be awarded Punjabi Culture Promotion Award, Daljit Sandhu will be awarded Punjab Electronic Media Award, Avtar Singh Banawali will be honoured for his philanthropy, Harvidner Singh Khalsa will be awarded Prof Mohan Singh Award and Olympian Rajinder Singh will be awarded Balkrishna Singh Grewal Award. North Zone Cultural and Punjabi Sahit Akademi has collaborated with Prof Mohan Singh Foundation for holding this function. Mela will be dedicated to renowned artist Abninder Singh Grewal. 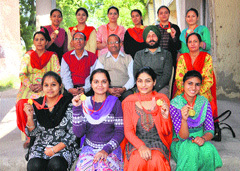 Speaking at the felicitation ceremony, college principal Vijay Kumar said representing Punjabi University Patiala, the team secured the second place and team members Mandeep Kaur was adjudged the best dancer. The same team had bagged the second place in the zonal youth fest and first place in the inter-zonal youth fest. Team member Jaspreet Kaur was declared the best dancer in inter-zonal competitions. College youth coordinator Dr Gurjit Singh Mann, lecturers Harjit Kaur and Balvir Kaur had trained the students. The members of giddha team include Mandeep Kaur, BSc III, Jaspreet Kaur, BSc III, Gaganpreet Kaur, PGDCA, Kirandeep Kaur, BBA III, Gagandeep Kaur, BA II , Deepinder Kaur, BSc II, Kalakrit, B Sc II, Navneet Kaur, BSc I, Priyanka, BBA II, Pushpinder Kaur, BSc III and Amandeep Kaur, BA I. Bus passengers said the bus, which belonged to the Malwa Transport Company, was being driven at a high speed and even as there was hardly any space to overtake the truck trailer, the driver went ahead with it resulting in the bus veering off the road to overturn in the nearby agricultural fields. The bus was on its way from Maur Mandi to Bathinda after picking up passengers, mostly office-goers and college students, from Chathewala, Jodhpur Pakhar, Jiwan Singhwala and other villages en route. The bus left Chathewala for Jiwanwala and had not gone far before it met with the mishap. The injured were taken to the government hospital at Talwandi Sabo. Among the injured were three girls from Jodhpur Pakhar village, six from Chathewala village and one from Nath village. In a complaint to the police, Kuldeep Singh of Gill Kalan village stated that he had applied for the bank loan of Rs 3 lakh. Mangla sought one per cent of the amount. The complainant pleaded that he was unable to give Rs 3,000 but could only pay Rs 2,000. Later, Kuldeep Singh brought the matter to the notice of the SSP, Vigilance, Sukhdev Chahal, on whose direction inspector Gurdev Singh and his team caught the accused bank official red-handed while accepting the bribe from the complainant.